Brings us to yet another finished object. 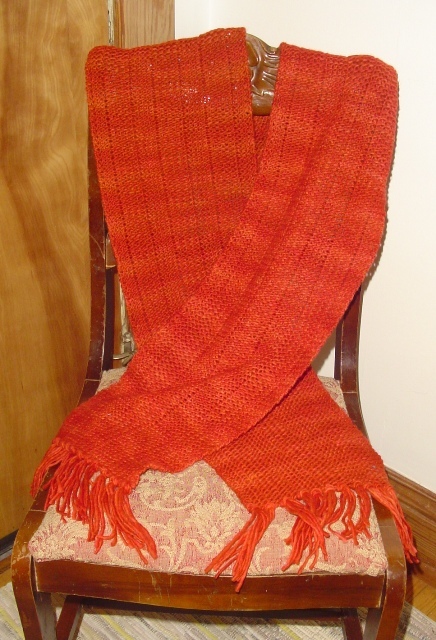 This scarf turned out so totally different than the red scarf that it is almost startling! 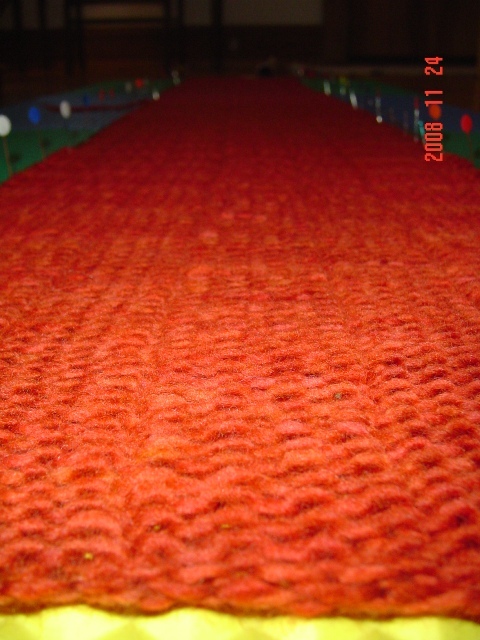 With the red scarf, I had to coax width out of it during blocking. With this one, I had to coax out extra length while it widened easily. 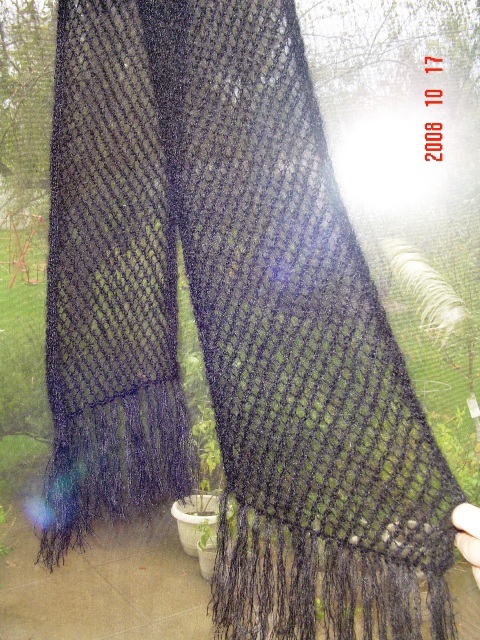 The malabrigo scarf was thicker and had a completely different texture. 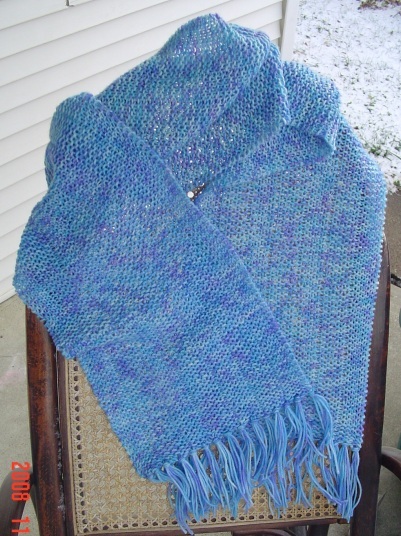 This yarn just widens and loosens during blocking, creating a very soft and drapey scarf. Both are beautiful though. In which Shells feels like she is making great headway! I am a bit more than halfway done with this project. I am using Dream in Color Classy colorway Some Summer Sky. I really am enchanted with every single Dream in Color colorway, but I liked the malabrigo for this scarf better. Mostly because the vertical lines were more pronounced. That being said, this is still a very nice scarf. I am actually hoping to finish it up today providing I have the time while still on vacation. Reason? Above all because the yarn for the final project has not arrived yet, so that would allow me a little bit of time to work on something all my own….and how I do crave that! Wherein Shells is pleased to have found her way out of mohair hell! Tomorrow I’ll show you the next project…. In which Shells distracts her readers with a completely different project and wishes them all a Happy Thanksgiving! 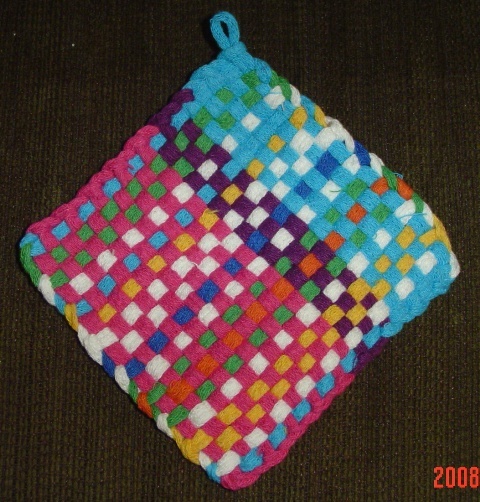 Bug has been learning how to make potholders on her potholder loom. She is really quite good at it, and though she has been in tears more than once over her desire to have perfect potholders, her first looks quite good. Now, I must add, I did weave the loops at the very end because they are hard to do and causing her much frustration, and I did the crochet bind off. But I am super proud of her! I think the fact that she understands the over/under concept at 4 is pretty darn good. In which Shells feels like she has very little to show for the last 3 days of knitting. This scarf goes slower than the others. And I like it less. So I can practice an amazing amount of avoidance. I am hoping that the visit from my mom will provide me with the distraction needed to finish it up while she is here. The good news is that this is the beginning of the second week. And I am already part way done with project 3. Which is really a good deal! In which Shells shows you another finished object and ignores the mohair scarf almost completely. I love this scarf! The malabrigo makes such a wonderfully soft and warm fabric. The pattern is great, simple and comfortable. It is not nearly as orange as this picture suggests, but in the absence of sunlight, this will do. Wherein Shells delves once again into what can only be known as mohair hell. Meanwhile, the red scarf is blocking and I have to add the tassels when it is dry. I will soon have that as a finished object as well. This puts me a week and a day ahead of schedule. I am very pleased with that. 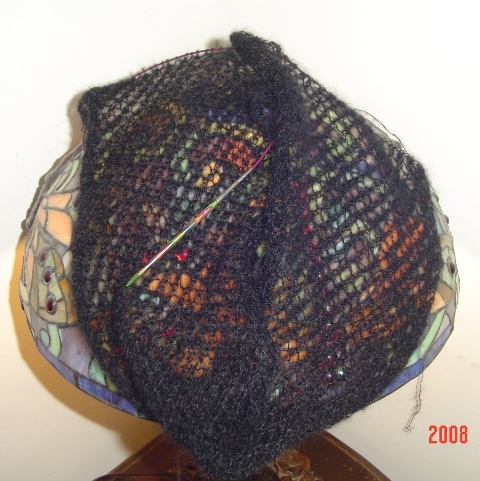 Maybe I can have the black scarf done by the time my mom leaves? I am happy with the fact that I was able to create significantly more width by blocking viciously. I have one more of these to make, and it is good to know that I can add just 2 more stitches to get the look I want, rather than 10 more. I figure an hour spent blocking, which I’d do anyhow, is better than countless hours more knitting. 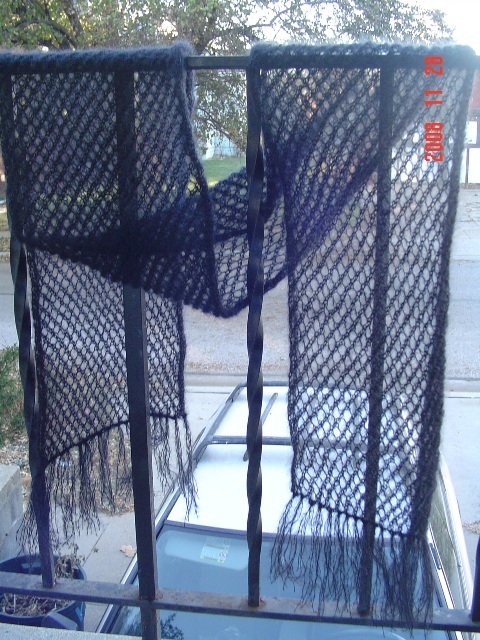 I did have to make the scarf extra long in order that I could block it in width, I lost a lot of length that way. But it is still a six foot scarf, which is more than enough if you ask me!